Enterovirus (in short EV) is a group a viruses which are responsible for causing nothing more than cold. There are around 100 different viruses that come in this group. Enterovirus cause 10 to 15 million infections every year in US alone. Recently one of these viruses, EV-D68 to be specific, has created a fear among people. 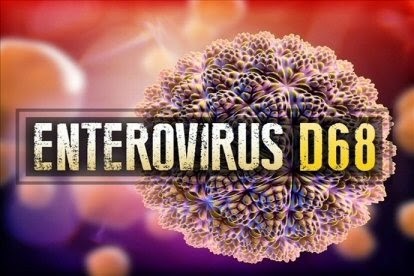 Death of a kid was reported and some reports have suspected that its due to Enterovirus D68. That kid slept without any symptoms and died in sleep. Who is at Risk of Enterovirus EV-D68 ? after the infection as their immune system is more strong. Those who are asthmatic are at risk, as this Enterovirus is reported to cause breathing problem, which may make the condition worse if it combines with Asthama. Most of the symptoms of Enterovirus symptoms are same as a bad cold. To be precise we are listing the symptoms of Enterovirus below. How Does Enterovirus EV-D68 Spreads ? EV-D68 is found in the respiratory secretions of infected person, such as saliva, nasal mucus, or sputum. It can easily spread from person to person if the infected person coughs, sneezes, or touches a surface that is then touched by others. What to do if you think you are infected with Enterovirus ? If you or your child / infant shows the symptoms of Enterovirus and having difficulty in breathing then visit your doctor immediately. If you or your child have a history of Asthma then you should hurry up as EV-D68 is more dangerous for asthmatic people. Enterovirus spreads like the common cold so you should take following preventive measure to protect yourselves and others from this virus. Cough into a tissue and then dispose it. If you don't have tissue then use your upper sleeve, not your hands. Most of the cases of enterovirus infection occur in the summer and fall. Labs is your city can diagnose Enterovirus by taking sample from your throat or nose, but they can't specify if its EV-D68. It can be diagnosed only at CDC or State Health Department. To know the exact number of cases of Enterovirus EV-D68 outbreak you may visit the following page of CDC.